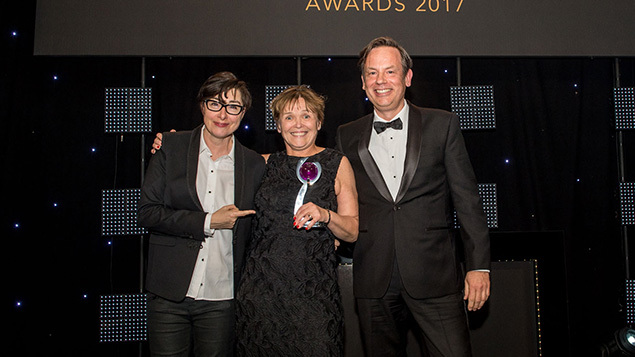 The Lawn Tennis Association’s Vicky Williams was triumphant at this year’s Personnel Today Awards, with a convincing win of the coveted HR Director of the Year award. We take a look at her achievements and those of our runners-up in one of the flagship categories, sponsored by XpertHR. Faced with a decline in tennis participation and criticism by leading players like Andy Murray, the LTA brought in Vicky, who had previously worked with Compass and M&S, as director to kickstart a strategic shift. A new vision, culture, framework, set of values have subsequently been developed, which have delivered excellent results including a dramatic improvement in tennis participation (up to 5.2% from -5.4% – but currently +8% this year) and 85% colleague engagement. Vicky recognised that the business needed to reach the 25,000 volunteers who supported strategy delivery, so appointed a volunteer HR lead to ensure that volunteers felt part of the LTA colleague base. Under her, the HR team ensured that LTA’s volunteers and staff felt that the new strategy was “their” strategy and that they fully understood that the organisation’s vision had shifted from winning in tennis to participation in tennis. Training is now delivered in bite-sized chunks, a staff suggestion scheme has been implemented, and there are flexible working and secondment opportunities. HR surgeries are available to provide teams with specialist advice and there has been a rise in mentoring. The results have included: much higher parent and coach satisfaction ratings; an NSPCC award for diversity and inclusion; reduced insurance costs by £20,000; reduced labour turnover (from 32% to 15%); and more effective workforce planning and succession. The impact on grassroots tennis can be witnessed by figures showing that park tennis bookings are up by 43,000. Galliard Homes is a family-run, privately owned property development company. Victoria joined as group head of HR in 2014 with the remit to “bring HR to the business”. During the past three years, Victoria, leading a team of six, has developed and implemented the full spectrum of HR services, tailoring her approach to suit the sector-specific needs. During this time headcount has doubled to just under 700 employees. Employing people of 38 different nationalities ranging from 16-78 years old, Victoria has promoted diversity and corporate social responsibility across the group. A corporate sponsor of Women Into Construction, Victoria works with local councils to fund construction skills training. She has also pioneered the Learning Academy, launched in 2016, which recognises the different ways in which employees like to learn and offers pragmatic solutions to address skills gaps and learning needs. Kate Clayton joined Vision Express in January 1996 on an apprenticeship programme aged 17, after deciding to pursue a career in industry, rather than move into higher education. She progressed into the roles of HR manager and head of HR before becoming director in early 2014. Today she oversees a 4,500-strong workforce at almost 400 stores in the UK and Ireland. During 2015 Vision Express moved its supply chain model from local business level to parent company GrandVision’s centralised level. Kate oversaw the new system and training implementation, partnering with key business functions locally and regionally. One hundred percent key team retention was achieved throughout programme. Kate also met the challenge of retaining key store managers by implementing a regional business partnering model in which every regional manager is partnered with a field-based HR representative. This has led to every store having a clear talent succession/development plan. She has also implemented a highly sought-after apprenticeship programme and ensured that the Vision Express culture is established quickly after acquisitions. She also successfully managed TUPE transfers with no compulsory redundancies in closure stores. Joining KP from Coca-Cola Enterprises at the end of 2014, Johanna Dickinson was a first-time HR director with good generalist experience but new to the magnitude of role at KP. At the time, KP Snacks was had been acquired from United Biscuits by Intersnack Group. Picking up a business after three site closures, one green field site opening and a head office relocation were among the challenges. The company needed someone who could galvanise the team and take KP Snacks and the HR function to new levels. Johanna soon was able to create a vision and common purpose within her function, focusing her senior team on just six core projects from a list of more than 25 competing priorities. She helps members of the team recognise and take advantage of opportunities to develop and as a result KP Snacks has seen seven internal HR moves and promotions in the past two years (from a team of 22). Although the team has decreased from 28 to 22, its capability and delivered outputs have increased. Johanna also knows the value of raising the profile of KP within the industry and brings ideas into the business to help it to grow from her involvement in the likes of the Grocery Aid Welfare Strategy forum, the FDF Education and Skills Forum and IGD HR Leadership Forum. Before Kathryn joined in early 2015, the company was made up of four separate businesses across seven countries with 9,500 colleagues all working to different visions, values and KPIs. The 242 cinemas were structured differently so there were no economies of scale or sense of working with a shared vision and values. As chief people officer, Kathryn’s role has been to lead a step change in the people strategy and embed a high performance culture. She has united the separate HR teams to form one team that works together rather than in separate silos. Shared principles were developed for consistency of approach and a strong commercial focus has been instilled. Kathryn has also created an insight-driven employer brand to attract and retain the best people and empower colleagues to give outstanding guest experiences. This is called Our Colleague Journey. Implementing this strategy has delivered innovative, bespoke products for each stage of the Colleague Journey, with a clear and transparent set of expectations, a real purpose to colleagues’ work and the opportunity to build skills for life. Kathryn’s vision and innovative approach to people strategy has developed the HR function beyond its previous transactional remit to lead the business in engaging our colleagues across all territories, directly impacting the company’s performance. The company uses the McKinsey OHI diagnostic tool to understand its health. Between 2014 and 2016 its overall score rose by 20 points. A variety of other ratings are testament to the improvements wrought under Kathryn’s leadership such as being placed at no. 25 in the Sunday Times 30 Best Big Companies to Work For.